One of the World's Largest Public Art Event, the CowParade is coming back to Sao Paulo from November 18th to January 17th. 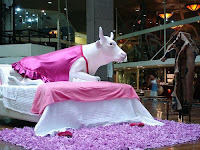 The cows will be displayed on several streets of the city, but the addresses are not defined yet. Marangoni, Sonia Menna Barreto, Luccas Pennachi, Inés Zaragoza, Marcelo Faisal, Glauco Diogenes are some of the artists who will sign the cows in this second exhibition of Sao Paulo. CowParade events have been staged in over 50 cities worldwide since 1999 including Chicago (1999), New York City (2000), London (2002), Tokyo (2003), and Brussels (2003). Dublin (2003), Prague (2004), and Stockholm (2004), Mexico City (2005), Sao Paulo (2005), Buenos Aires (2006), Boston (2006) Paris (2006), Milan and Istanbul (2007). Over U$ 20 million have been raised through worldwide charitable organizations through the auction of the cows, which take place at the conclusion of each event. 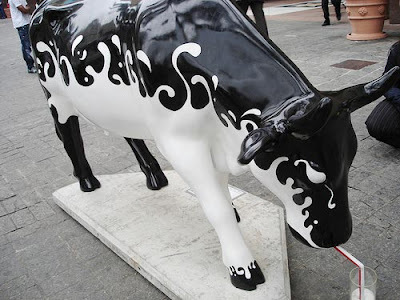 Over 5,000 artists worldwide have participated in CowParade. In Brazil, about R$ 3 million was donated to the institutions, the result obtained by the auction of unique works created especially for each issue. On 2009, the Foundation Gol de Letra is one of those chosen to receive part of the collection. 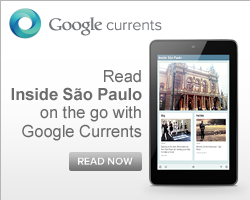 68 different proposals of art were chosen to the 2009 São Paulo Issue. 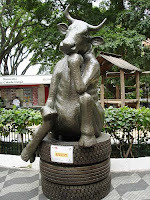 According to the CowParade Holdings Corporation, the cow is an universally beloved animal. The cow represents different things to different people around the world — she's sacred, she's historical, she connects us to our past — but the common feeling is one of affection. There is something magical about the cow that transcends throughout the world. She simply makes everyone smile.